Cho U Eliminated from Oza: Cho U seems to have an affinity with the Oza tournament and has played in the title match six years in a row, winning it four times, then losing the last two matches to Iyama. Altogether, he has won this title seven times, but his good run has come to an end. In the first round of the final section of the main tournament (the round of 16), Cho (B) lost to Murakawa Daisuke 7P by half a point. Ichiriki Wins O-kage Cup: The O-kage (literally “gratitude”) Cup is a tournament for players 30 and under sponsored by O-kage Alley, a street of tourist-related shops (many of them recreations of Edo-period buildings) in the street leading to Ise Shrine, which is one of the two most important Shinto shrines in Japan (the other being Izumo Shrine). The 5th Cup was held on May 15 and 16, with 16 young players taking part. Ichiriki Ryo (left), last year’s winner, followed up his victory in the Globis Cup the previous week with another victory. 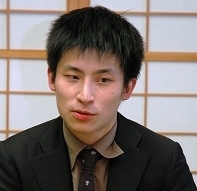 In the final, he beat Seto Taiki 7P (B) by resignation. This is the 5th minor title that the 16-year-old Ichiriki has won. Both these players will represent Japan in an international version of the title scheduled for the autumn. Kono to Challenge Again for Gosei: Kono Rin 9P (right) will try to improve on his 2-3 loss to Iyama Yuta in last year’s Gosei title match. In the play-off to decide the challenger for the 39th title, Kono (B) beat Cho Riyu 8P by resig. The title match will begin on June 26. Cho missed out on his first chance to challenge for a title, but he should be back. Aged 32, Cho seems to have improved recently and he is enjoying good results. Born in Taiwan, Cho makes a big contribution to Japanese go by acting as a coach to young players in the national team; he often escorts Japanese representatives to international tournaments. Kisei Leagues: All the games in the first round of the 38th Kisei A and B Leagues were played within the month. The A League got off to a start on May 22 and the first round of the B League was completed. The last game in the A League was played the following Thursday. Results: (May 22) (A League) Takao Shinji Judan (W) beat Hane Naoki 9P by 3.5 points; Kono Rin 9P (B) beat Yamashiro Hiroshi 9P by resig. ; (B League) Cho Chikun (25th Honinbo Chikun) (B) beat Yuki Satoshi 9P by resig. (May 29) Yamashita Keigo 9P (B) beat Ichiriki Ryo 7P by resig.